we just did the Invasion twice and topped out at 935 bonus points, 65 short of 1000 needed for Gold. We have no idea what we could have possibly missed, we saved everyone, saved every building, killed all enemies at the gates. We had a Warrior at the Eastern Gate, a Mage at the Souther Gate and Pala did the town center and brought back the terrified townsfolk. What did not happen is that both times we did not get the spy as an event to spawn. When I was lvl94 doing it the first time he spawned. I think it was announced even as a warning. I am guessing he is worth 75 bonus points at least just like the terrified townsfolk. Any idea how to get the spy ? btw: you start this invasion by farming in the lvl100+ areas. Did shattrah elites worth 3000 reputation to spawn it. but that might have been excessive. You also need to finish your SMV quests to be able to trigger this as far as we know. 1. Immediately upon "special" spawns (spies, lost laborers, big mobs incoming) go there and kill/save them. 2. Between the special spawns, have your group spread out and kill the regular mobs as quickly as possible. They come into your garrison near each of the 3 gates and also spawn in the center of the garrison itself (near your small buildings). 3. Revive any downed friendlies before they despawn. 4. Kill the final boss. Keep in mind, although he has a lot of hp he doesn't hit very hard and he is stunnable. We did this with a fury warrior (me), a dk, and a boomkin. All between 620 and 635 ilvl. We had about 950 points before the final boss spawned. Garrison Invasions are challenges in your Garrison that allow you to defeat attacking enemies for rewards. They can be completed solo but you are encouraged to bring your friends because the rewards are greater if you perform better. Your first invasion comes early on Shadowmoon Valley and Frostfire Ridge with a Tier 2 Garrison--midway through questing, a player's Garrison will be attacked either by a Thunderlord or Shadowmoon force. This is not available with a Tier 3 Garrison but it is also not considered a "real" invasion. When you kill level 100 mobs (in the areas for Apexis Crystal Quests), you have a chance that the enemies will prepare to attack your garrison in retaliation. At this point, your commander by the Town Hall will have a quest for you. Note that you need to kill approx 500 mobs, and you can not be in the raid group. Party is allowed. Once you kill enough of them, you will get notification at your minimap, where you can see mission status. There will also be big yellow exclamation mark there, pretty easy to spot. Once you spot it, head back to your garrison and you will be able to take quest from Sergeant Crowler (A) or Sergeant Grimjaw (H). Assault - defeat the assault. The holdout - endure the assault. This part is timed for ~8 minutes. The enemy assaults a Garrison building—attack them to interrupt the cast. A terrified townsfolk runs out of safety. They are marked with a green arrow over their head and you run up to them to move them away. An infiltrator from the opposite faction is in your Garrison. These have a hefty bit of HP. Killing enemies—trickier ones give more points. When the invasion is complete, points are added for your buildings and defenders. You need 300 points for Bronze, 600 for Silver, and 1000 for Gold. Silver and bronze rankings rewards only apexis crystals, but if you managed to get gold reward you will get Invader's Forgotten Treasure which can contain 645 items (They can be warforged 651) and one of 4 mounts. Note that you can get each bag just once per week, yet you will receive apexis each time you do it. Where would you kill the Shadowmoon mobs needed to trigger this? At this point I have only done two invasions but I did this particular one with a group of 3 (Ret pally, MM hunter, Destro Lock) and we fell 30 points short of gold. Apparently we did have a spy spawn, but it did seem our over all mob count was low. We killed absolutely everything there was to kill. We saved every lost peon and literally none of our guards needed resurrecting. And yet we still had down time. As someone else did point out that mobs spawning from the door near the menagerie seem to sit near the entrance way. I was camping that door but in range of the center of town so I would periodically have to check to see if mobs were just hanging out by the door. Invasion quests persist from week to week if you don't do it the week before. Did shadow council with 2 guildies. The quest popped up for me(I DID NOT ACCEPT IT). Logged in Tuesday and the quest is still available! I made a video tutorial for this invasion. This is from the Horde perspective. Tactics: each player takes his gate to protect, kill red dots on the map as fast as you can. I share my macro to show what Invasion is completed. Here is my Macro for knowing whether or not you have received the Bronze, Silver ,Gold &/or Platinum rewards from doing a garrison invasion for the week. Not a complete list, but easier to figure out what missive you need, where it is, and what invasion it triggers. Credit to Loriculus on the battle.net forums : "Be sure to let all your extra credit points roll over before engaging the last boss. Seems like they stop accumulating when the boss fight is engaged." What I do wrong ? I want to start garrison invasion "Shadow Council" I Kill 700 mobs I still don't have a quest with start garrison invasion somone can help me what i need to do for start , except kill mobs? A lot of this information is now out of date. You can pretty much AFK and get Platinum if you're level 110+. 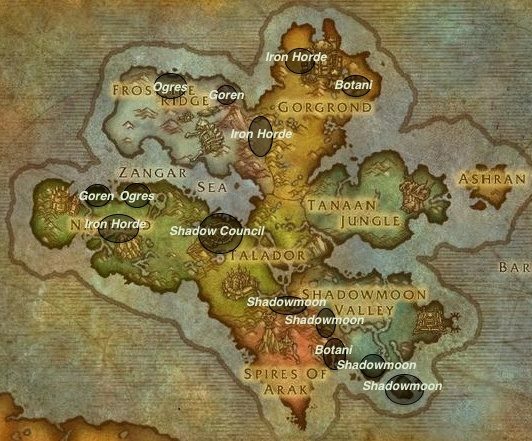 I see that no one has mentioned what missive you need to get a Shadowmoon Invasion. Here they are: Carta de Batedor: O Centro de Shattrath and Relatório de patrulha: Porto de Shattrath. Have fun achievement/mount hunters! Invasão do Concílio das Sombras! Rechace a invasão do Concílio das Sombras à sua guarnição. Um fogo frio ferve meu sangue, Comandante. Como se um bruxo tivesse meu coração em suas guardas. Que o Concílio das Sombras se revelem! Waugh! We beat back the demons, Commander. My blood's still boiling from it. My eyes aren't turning red, are they?